KIEV, November 26. /TASS/. The Ukrainian Border Service may ban certain categories of Russians from entering the country due to the possibility of imposing martial law in the country, said Chairman of the State Border Service Pyotr Tsigikal at a session of the National Security and Defense Council of Ukraine on Monday. "With regard to the current situation, we plan to tighten security and defense along the border," he said. "As for the checkpoints, there will be no restrictions for Ukrainian citizens. I suggest restricting entry to Ukrainian territory for certain categories of Russian citizens." Tsigikal did not specify whom these restrictive measures may affect. The initiative to impose martial law for 60 days in the country due to the situation in the Kerch Strait overnight into Monday was supported by the Ukrainian president and articulated by Secretary of the National Security and Defense Council of Ukraine Alexander Turchinov. On Sunday, November 25, the Border Service of the Russian Federal Security Service (FSB) in Crimea reported that three ships of the Ukrainian Navy illegally crossed the Russian state border, entered its territorial waters and were conducting dangerous maneuvers. The FSB Center for Public Relations later added that naval ships set off from Berdyansk in the Sea of Azov to help these Ukrainian vessels, but turned back later. 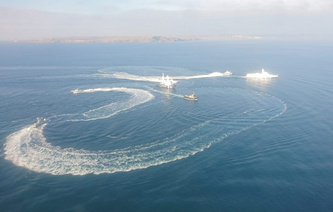 All the three Ukrainian Navy ships that had violated the Russian border were detained in the Black Sea, the FSB Center for Public Relations reported, and weapons were used to stop them. "Three injured servicemen of the Ukrainian Armed Forces received medical help," the FSB added. There is no danger to their lives, the security service added. A criminal case was launched on the violation of the Russian state border. The FSB specified that the Ukrainian side is aware of the procedure for the passage of naval ships through the Russian territorial sea and Kerch-Yenikale Canal. "They earlier used this procedure for innocent passage," the FSB reiterated.